It has been a little over 4 years since Abhishek Kapoor’s Rock On!! took the Hindi film audience by storm. With a new vibe, some new tunes and a cool story the director presented a new style to Indian films. The film was a big hit and went on to win a National Award. Fans have been eagerly waiting to see what he would bring us next and Kapoor has not disappointed! 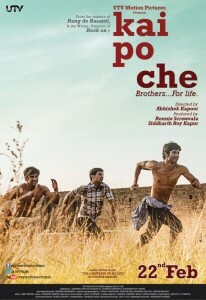 The director has adapted Chetan Bhagat’s novel “The 3 Mistakes of My Life” into the intense Kai Po Che. The drama tells the tale of three friends Ishaan, Omi and Govind – young, ambitious and restless – who are trying to make a mark in the India of the early 2000’s. Set in Gujarat, this is the perfect place for the 3 Ahmedabad boys to start a business that could be their ticket to fame and riches. In a country where cricket is religion, they hit upon a brilliant plan – to start a training academy that could produce India’s next sporting superstars! What follows is without doubt the greatest adventure of their lives, as they attempt to navigate the big hurdles in the path of fulfilling their dreams. Starring three relatively newcomers Sushant Singh Rajput, Raj Kumar Yadav and Amit Sadh, the film is set to hit theatres on February 22. The director took some time out to chat with us about all things Kai Po Che, check it out! What made you decide to adapt this book into a film? After Rock On! !, Chetan approached me with this book and when I read it I found the characters really fascinating and I felt I could really identify with them. More than that, the fact that he had woven factual events that had shook this country up like the earthquake and the riots – those were real events – and then India-Australia test match into this story. He has woven a fictional story about friends, and then the love story and so many other things into these factual events; I thought it was a great opportunity to tell a real film about India. Was it difficult to do, to translate it into film? Definitely. It was my most difficult work until now. We worked 2 and a half years to just screenplay this film to regain the sense of the most important things in the book. Not everything in the book is in the film and I added a lot more scenes to change around stuff so that everything would fit organically into the screenplay. It was quite a task. There are many themes in this film both light and dark… I mean you have earthquakes, religion, friendship, cricket, politics, loves and riots. How did you weave that all together? You know we did about 20 drafts of the script and after the 10th draft, I scrapped the whole thing. After a year and half’s work I scrapped the whole thing and started fresh again. It actually took awhile for me to reach the final stage but we somehow managed. And then you had to shoot it, that must have been very challenging as well. Oh yes, it was very challenging. It was made in 172 days and we were shooting in excruciatingly painful heat, I mean temperatures up to 48 to 50 degrees Celsius. Everything was shot on a real location, there were no sets used through the film. You can’t recreate certain things especially when you are working on a budget. That much detail is impossible to put on a set. We had to be in real locations with crowds. So the earthquakes and the riot sequences really took a lot. It was quite a task to accomplish. Tell us about casting the three actors, what were you looking for? Omi, Ishaan and Govind, they are the three main characters in the film and their friendship, the chemistry of it was very important. Initially, there were thoughts about casting a leading star in one of the roles but somehow that was not fitting organically into the film. It was not like in a typical Bollywood film where he would be a hero and the other two would be flunkies, you know? That is not what I wanted to achieve. We had an auditioning process, went through a lot of actors but when I saw these three boys together laughing, jamming and acting together there was something magical going on there. On a gut instinct I said these were the right guys for it. Tell us about working the new guys, how did you prepare them to take on the roles? A lot of it is about talking with them, talking about their characters, helping them getting into the skin of the characters. These are exceptionally talented boys, it’s just that they did not have a big platform yet on film. Sushant comes from television. Rajkumar has done some films but nothing on this scale. Amit had only been in one small film before but really not much for him. So really it was jamming with them, talking about the character and sharing the script with them and guiding them. Somewhere if they have got the talent, if they have what it takes… that is where the magic is, you know, on set when you start rehearsing and contributing and focusing and it all comes together. I am quite satisfied. If I had another month I would still work another month on it because there is no end to it. (Laughs) I am very satisfied and we were selected for Berlin, which was icing on the cake. Tell me about the brief you gave to Amit Trivedi for the fabulous music of the film. You know Amit Trivedi had done some work earlier, which was a little out of the box, you know? It had that contemporary feel to it. He is making his own space and his sound is unique to him. For this film, I wanted very Indian classical music. I wanted it to be classical because it is a classic Indian film. The story is so full and such a big story I felt and the characters had to be so real that I didn’t want any attention taken away from that. You know to funk it up or take any other attention. We had this great lyricist Swanand Kirkire and the two of them together created magic. They both understood what was required of them and they just nailed it somehow. Are the songs more of a background instead of your standard song in an Indian film or are they playing underneath the scene like a montage? All the songs take the story further. See it is such a big story I really didn’t have time to stop the story and have a stand-alone song like in a typical Bollywood film. The film is bigger than anything else. The response to the trailer has been fabulous, how does that feel? We have gotten the desired response we wanted and people have connected with it. People have understood that this is an Indian film, it is not your typical Bollywood potboiler. Even when I was making the film I wanted it to reach out to a bigger audience. I really wanted the film to connect with the world, to see what I see in India. It is my India. Somehow the promos are saying that and people can spot the difference between the other stuff and this one. Thank you! It just was through the story. We shot this film with a lot of sincerity. It was not just shooting it so it just looked good, we wanted the camera to be where it should be, you know? Sometimes you want the frame to be in or out and sometimes you want to be standoffish. Whatever came organically from the scene and from the screenplay is how we approached it. What are your thoughts of the movies today? In Indian films, there hasn’t been a better time. I am not a big fan of Bollywood. I don’t endorse it because I think that space, the Bollywood part of Indian cinema, is not putting enough in and some are cheating the audiences. I feel that way. I don’t have anything against the genre, just about the sincerity and effort that is made. They are not trying to better it in any way. They are stuck in the same old stuff and their excuse is the audience just wants this. I don’t believe that, I don’t believe the audiences just want that. We are just giving them that. Indian audiences love movies, so if you give them trash they are still going to watch it and they love their stars! I think it is time to change that Bollywood space and move into a more responsible Indian cinema space, which we can share with the world. I don’t think Bollywood films connect with the international audiences. They are looking for something in it but they are really not connecting to it. They are looking for it; they want to see more of India and somehow they are seeing something that is not connecting at all. It is the same song and dance. We say yeh hi chalta hai and chalta hai our attitude is what is really pulling us down. 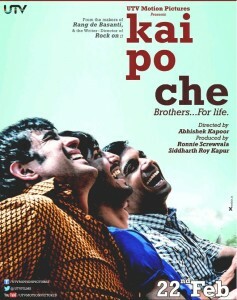 What can audiences expect when they come see Kai Po Che? They will definitely get to see an emotional film about India. It is how I see my India and what many would say is the real India. In my opinion this is what India is about. Talking to an international audience, they will get to see a film that is not just about power in India, it is about the social value system in India, the aspirational values and the entrepreneurship that comes in a Gujarati community. 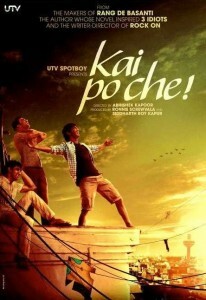 Kai Po Che, now I know it is a Gujarati call for when you cut the kite, but why that title for this film? Because from our end, with this film, we wanted to do something new. Kai Po Che has a great sound to it. It actually means I have cut, so metaphorically it suits the story line well. Once you know what it means and you see the film you will understand why. 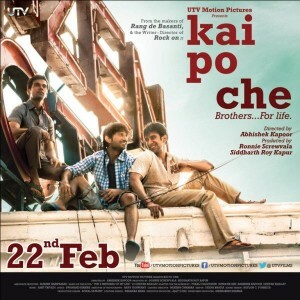 Kai Po Che is in theaters on February 22nd!